Hi everyone I hope you are all well or as well as you can be. 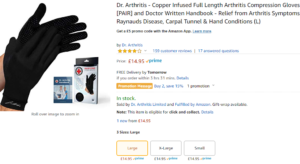 I have been asked by some of our subscribers about arthritis gloves and which ones are best. I think as it is the winter season in a lot of places people are trying to get prepared and keeping your extremities like feet and hands warm is a great idea! As I have had a lot of enquiries about socks and gloves I thought I would do some digging. The socks are easier for me, as I have arthritis in my ankle I have obviously already had an in depth look at socks and I will do an article about them shortly. In terms of gloves for arthritis, I had to do some more research as normal insulated gloves are enough for me. For those who need a more specific glove for their arthritis, I have some choices below. 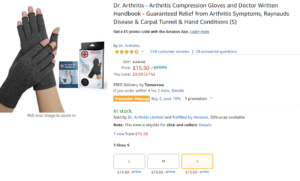 Dr. Arthritis is a popular brand and many of you may have heard of them. These compression gloves are an excellent choice for combating swelling and reducing pain. They help many forms of arthritis including rheumatoid, osteo and psoriatic. The gloves have a fantastic response from customers as well. They have over 250 reviews and currently average 4.6 out of 5. Meaning customer satisfaction for this product is very high. Many people suffering with carpal tunnel syndrome have also found these gloves to be an incredible help. 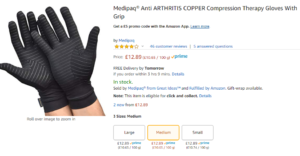 If you like the sound of this product then click here to purchase, Dr. Arthritis also claims that they will donate 10% of the sale price to the Arthritis Foundation! A product by IMAK, developed by an orthopaedic surgeon. The product is available in five different sizes so there should be an option for everyone. It does explain how to measure your hand so you make sure you get the correct size. Again this helps with arthritis, carpal tunnel and fibromyalgia as well. The product has over 300 reviews and currently averages a score of 4.2 out of 5. Showing that there is a large majority of satisfied customers for this product as well. The lower scores on the reviews tend to be some years old and usually mention the size not being correct. I don’t know if the sizing help was added after this to solve this problem, so bear it in mind. What is with the missing fingers? This was my question as I looked at various arthritis gloves. I believe the majority are finger-less so you can still grip things, for instance you can wear them at work in an office when typing or writing. Which is fine but I know that some people will be thinking what about outside if it’s freezing my fingers will get cold?! Well I suppose you could pop a pair of normal gloves over the top or I have found a couple of full finger gloves below. Once again these are a Dr. Arthritis product, they seem to be the big name players when it comes to arthritis gloves. A few things that attract me to this product is that they are fairly inexpensive, they have a promotion where if you buy 2 you get 15% off and like anyone else I love a bit of discount! They are copper infused as well which grabs my attention. Copper has been used for years to help circulatory problems especially in the hands. You may have seen a copper bracelet on your Grandma or heard her mention them. In terms of review scores it currently stands at 4.1 out of 5 after 150+ reviews. Some things to be wary of here, a few customers have spoken of poor quality and the seems splitting. I have also seen this same product repackaged and sold at nearly treble the price online so be careful and check where the product is from. You can take a look at the gloves here. I have chosen this product because I have experience of dealing with Medipaq. 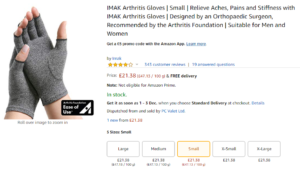 I have bought many of their socks for arthritis relief and never had any problems with them. So with that in mind if ever I need a pair of arthritis gloves there is a good chance I would pick these on that basis. The gloves come in 3 different sizes and have anti-slip grip which means you can keep them precious fingertips covered up and still perform daily tasks! They are also copper infused and compress to aid with circulation and blood flow as well as reduce swelling. There is a handy glove size checker that I would recommend you use to work out the correct size before buying. The average score is currently 3.8 out of 5 based on 46 reviews. The majority of buyers here have given 4 or 5 stars, again the lower scores are mainly regarding poor quality but the many better scores make no mention to poor quality so you will have to decide for yourselves. As I mentioned earlier these may well be my choice because I have used Medipaq and personally have never had a problem, maybe other consumers can comment below and provide some more clarity. You can view these gloves here. I have given you 4 choices above and I hope they are suitable for those of you who have been asking which ones to buy. I had an email the other day asking which ones to buy as the person in question had seen gloves priced at over £60! In my digging around I found some unsettling information. The particular gloves priced at over £60 were available to people in the U.S. for $19! They also included reviews from customers about poor quality on the American site, yet on the U.K. site the product had no reviews. Meaning someone could take the gamble to buy them as there are no reviews to be read and be charged £60, plus nearly £15 delivery! Be careful what products you choose, do your own digging because unfortunately there are companies out there who will look to exploit people in there time of need. I will post the article regarding the best socks soon, including ones I have personally used! Thanks for reading and please comment and share.